Columbia, Mo.-The Cougars receive exciting news as Coach Tomas Brock has been promoted to Associate Head Men's Basketball Coach at Columbia College. Brock spent the past three seasons as the assistant coach for the men's team before the promotion. Brock has proven to be one of the key factors in the program's success over the past three years. 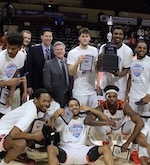 In Brock's time with the Cougars they hold a record of 83-17, have captured regular season conference champions all three years, and claimed one AMC Tournament Title. 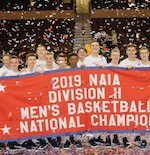 In addition, they have made a National Tournament appearance each year, while making it to the second round two of the three years. "Tomas has served the student-athletes in our basketball program at an exemplary level for the past three years," said head coach Bob Burchard. "He is an exceptional coach, has been recognized at the highest levels of our profession as a rising star, and mentors our young men providing guidance in their individual development academically, socially, and on the court. This promotion reflects his commitment to our program and the students we serve." "I'm proud of the work we've done and the success we've had over the past three seasons," said Brock. "It's always a joy for one's work to be recognized with a promotion, and I'm grateful to Bob Burchard for this recognition. I look forward to continuing to serve our student athletes in this new role."